I just wanted to thank you so much for your benefit performance of They Call Me Mister Fry for our SAVE THE PLAYHOUSE CAMPAIGN. I know you put a lot of effort, time, and personal cost into the making our benefit successful and to fill our theater. Not only did you sell all our seats, but you put on a first rate show that made the audience laugh, cry and think. Wow! As I told you at the theater, it’s so nice to hear all the wonderful comments made after the show. It’s not only a reflection on you, but it’s a reflection on the Playhouse. And it proved to be a perfect opportunity for us to add new patrons our mailing list. Once again, it was wonderful working with you, and thanks for all your hard work and talent to aid in our efforts to SAVE THE PLAYHOUSE!! 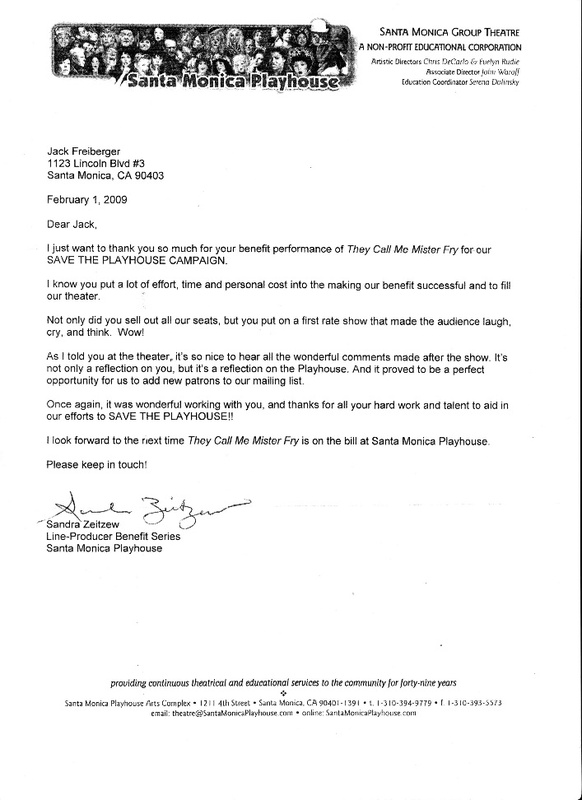 I look forward to the next time They Call Me Mister Fry is on the bill at the Santa Monica Playhouse.